It’s been a whole five days since I was at the airport. Tonight I’m flying to Guernsey for the Granite Man triathlon, a half Ironman distance event. Unfortunately, when doing a lot of flying and little sleeping, it’s easy to get run down and catch bugs off fellow passengers, which is what has happened to me. It’s just a cold, but it has come at a rather inopportune time, leaving me lethargic and aching. I’m flying out and shall see how I recover by Sunday morning. The Granite Man has only 110 entrants doing the middle distance course, so it will be a small field. The reason should hold off and temperature will be a comfortable 11-14c. Fingers crossed I have a speedy recovery! what’s in the bag? a trombone? Good question. 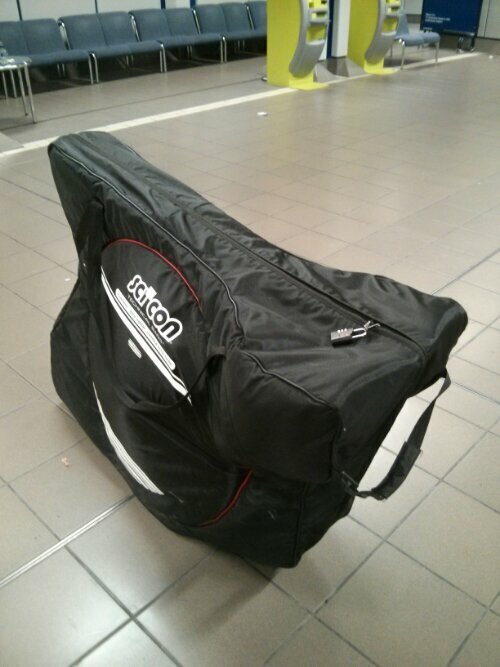 Both the bag and bike made it in good condition. One thing I like about this particular bag is that there is minimum reassembly required (no pedals to replace, etc). Not bad for a freebie! Good luck for your race!